Hello sweet people! I thought I’d show you a few photos of my daughter’s room today. I’ve mentioned a time or two that I’ve been working on it and while there’s always more I’d love to do, I’m just going to call it done. Yay! The color combination in this room makes me think of Neapolitan ice cream…so yummy…with lots of pink, brown and creamy white. The duvet and shams are from Restoration Hardware. 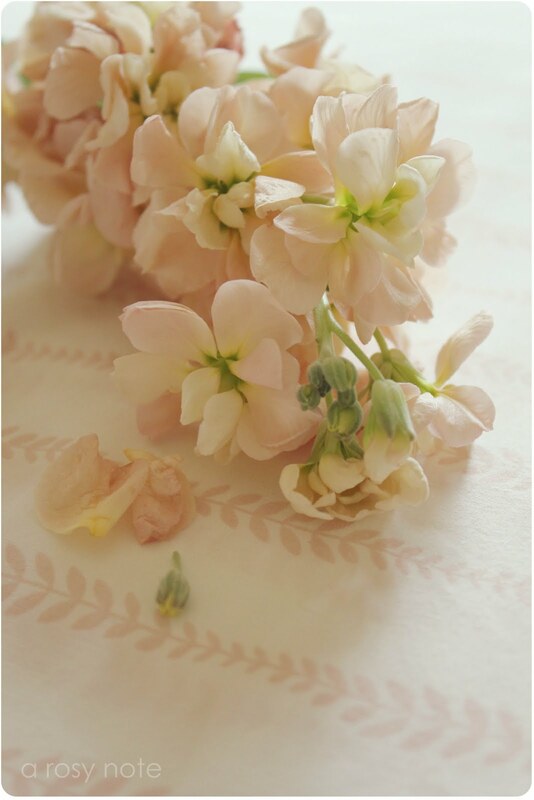 They’re soft pink and have ruffled frayed edges, which I think gives them a nice old well-loved feeling. I found the sheets at Bed, Bath and Beyond and couldn’t believe how well the color matched. I love the pattern too…very simple with a white background and pink leaves. Of course, I had to add some flowers to pretty things up. I found some beautiful peachy-pink Stock and some Chamomile too. I popped them into this old enamel bucket for a nice informal flower arrangement. A few of the things in her room I made…the slipcover for the lampshade, the bedskirt, the brown bed pillow, the chalkboard and the white pennant flags. Gotta give a shout out to the Mister too since he made the bench. Oh, your photos! I just can't get over your lovely photos every time I come over here. That room looks pretty darned done to me! I'd be delighted to have it myself. I'm gonna pin it to my Pinterest in fact. Keeping it neutral is the smart thing to do. That way the accessories can offer pops of color. It's a relaxing, inviting space. Well done. You have done an amazing job on her room & I did not know you were also talented on the sewing machine! May I ask you where you got the white "E" on her wall? I would love to have one like that for Livvy! You have such a wonderful style. I love how you keep things simple & not overly done.. but very interesting & calming on the eye. Your work is stunning! both the decorating and the photography! yummy yummy yummy! The room looks beautiful Tricia! I just love the skirt. What a great job. Did you attach it to a flat piece or did you use velcro? I want to make one that is easy to remove for my own room. I agree with Brenda. The photos are gorgeous. How do you get the soft tones like you do? What a sweet room! You did a wonderful job on it! Such a sweet and calming bedroom! I looks gorgeous! 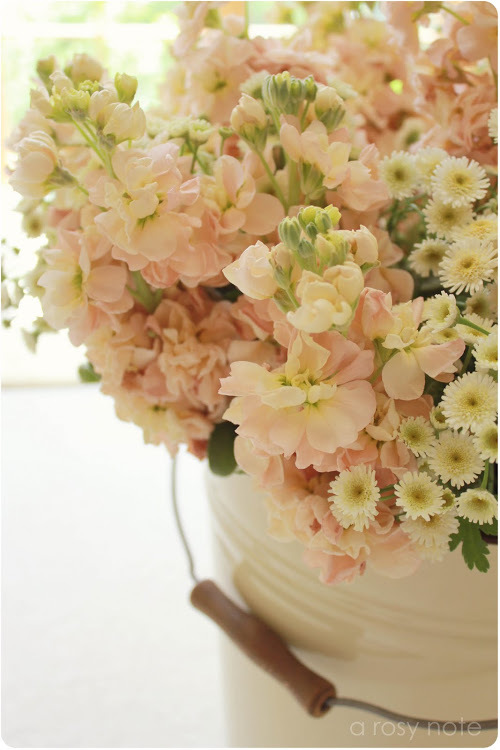 I love the color palette, very delicate and feminine. With the neutral tones, she'll definitely be able to add lots of bright colored accessories/toys to her heart's content. Love your idea. And wow, you made that bed skirt? My jaw just hit the floor. Just wow. Great work all around. This is beautiful Tricia, and your photographs of it are wonderful! "torrified"…that is sooo cute! and so is her room! job well done. A charming room…how happy your daughter must be with the end results. her room is absolutely gorgeous. Oh Tricia, I think it's adorable. It does fit in with your home so well and looks so "girly" too 🙂 Great makeover. I'm sure "E" is very proud! Beautiful! You did a great job, it all looks so lovely. Okay, I seriously want to be your daughter because that is a seriously pretty room! wowzers! I love everything about it and your photographs are lovely. What a peaceful room~ I love it! Always so very lovely…some day I am going to have you come help me fix up our house:) You have such a gift and I love seeing what you can do to a room. Adore the bedding and, of course, the color combination! Love all the handmade touches. My youngest daughter has the same bed frame, which has always been a favorite of mine. Tricia, A lovely room. Love the flowers in the bucket. i am in love with this room. it's so peaceful and pretty…i love the bunting 🙂 the creams and pinks are just perfect! What girl would not be happy in a room looking like that. It is soooo charming. The photo's are stunning ! This looks like a room right out of a magazine and the bed skirt is amazing! The colors are perfect! I am always amazed by what you do. You are fantastic and I love it!!!! Can you come and do my house???? So pretty! Linking from My Romantic Home. It makes me want to sink right in. It is very pretty and comfortable. Feels cozy and uncluttered. It's really lovely. Where are the pillow cases and duvet cover from ?I love the large ruffles. Its so feminine and absolutely beautiful! She must love it! I love all your gentle touches..that paikl with the flowers is perfect and soft. The chalkboard is great in there! All the love poured into that bedskirt…you're amazing Momma! It makes me wish I was a little girl again just to have a room like that !! Beautiful labour of love..and the photos are perfect!!! This is so sweet. Thanks for posting the photos. You are educating your daughter's eye by surrounding her with subtle good taste. I hear you on the bedskirt sewing. Most of what you can buy are boxy tailored ones, and the ruffled ones are skimpy. When I made one of drapery weight fabric I thought my sewing machine would gag! The next time, rather than attach the ruffle to a mattress cover, I just hemmed one very long length of fabric and ran elastic through one long hem, then pinned it to the mattress cover after arranging the gathers. I have to say that the bedding looks fantastic!! It's pretty, neutral and cute. Perfect for a young little girl. And the flowers are stunning. What a lovely room! Loved hearing about the torrified pennant! Kids can be so funny. The bedding is just so pretty too! The bedroom looks very welcoming. I love the flag garland and the bucket with the fresh flowers giving the room a festive touch. A very sweet room, and wonderful photos! You show your flowers so well! Your daughters room is so sweet, I love it, I'm sure she loves it too. You have a beautiful blog, I read back several months and your photos are all amazing! Beautiful! 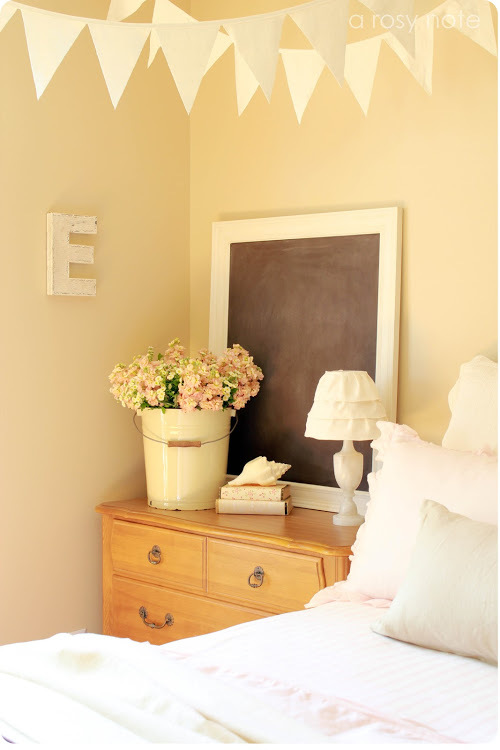 So soft and pretty…..wish MY room looked this serene!! You've created such a peaceful and pretty room for her. I love the tooth banner. Cute bench. and grow up in, Tricia! what gorgeous photos! I would love to have that as my bedroom! Tricia, your daughter is the happiest girl in the world. Oh Tricia it looks absolutely wonderful! Her dreams will be a little sweeter now! My daughter is just graduated from college and her room right now looks like a bad mix of her, me and her dorm "stuff". This room will not get a makeover until she moves out! I am not rushing it but I've already started my idea file! This is so lovely, fresh and clean looking! Love it!! It's lovely, Tricia. I love the way your rooms are so recognisable. You have such a thread running through your house. It must be so calming to live in. May I come and stay with you??? This is heavenly! Oh my what a lucky girl! How beautiful! Looooove it! Great color scheme. 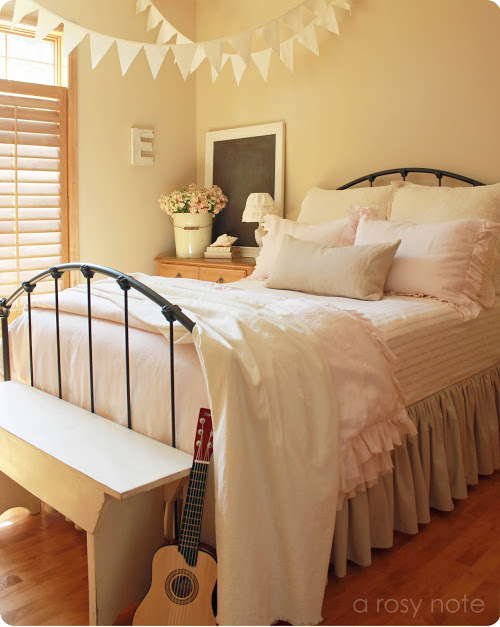 Your daughter's bedroom is so pretty and dainty! I love the delicate florals in the enamel bucket! This room is amazing! Your photos are amazing! Your talent is amazing! Should I say amazing again or stop there? I just visited your Blog, and while reading it, I noticed that we have alot of the same interests. I love creating, decorating, photography, and roses – especially red roses. Me and my daughters just started a new blog, and we would love it if you could visit us and follow. The link is: http:redrosealley.blogspot.com We just recently did a post about "Home Treasures," and it will give you a chance to get to know us a little better. Hope to hear from you, and have a sweet day. Your daughter's room is so Cute! I love the color palette! So versatile too because it will grow with her. Lovely photos always! Thanks for linking this up at HSH! I can't get over how beautiful your pictures always are. I really do think somehow, some way it should lead to more great things for you! And I think cupcake's room looks super cute…geesh girl! Oh Tricia, your daughter's room so beautiful! Great job on sewing the bedskirt…. it's so pretty! Hope you and your family have a great Father's Day! The room is adorable! Nuetral is always a good way to go. A great job! Oh, the room looks beautiful! So lovely and sweet just like your little angel. Your photos are great. I love the bedskirt you made, it's perfect with all the other wonderful linens. Beautiful room and I love the soft palette. And your dining room is looking gorgeous as always. You can have some of our heat! We were up to 100 or 101 today with the heat indexes beyond real. I think the indexes were 110! Not fun, especially when I wanted to paint in the garage. I did attempt to, and felt like I was in an actual sauna. Lot's of showers here ! A little girls room doesn't need to be frilly and pink. the colors you chose are soothing. OH Tricia…I am just getting caught up with all your beautiful posts that I missed! They just get better and better…your dining room is lovely and your daughter's room is just precious. All your personal touches are wonderful and your photos are always fabulous! Bloom? Oh yes…you are so inspiring! The picutre are so beautifull i come over here and hope you look one of my blog.. I love what you did to this room! It looks so cozy and inviting! Soooo very pretty! I love the colors! And your photos are gorgeous 🙂 I'd love to hear how you take such beautiful photos! Your talent(s) continue to amaze me Tricia! What a beautiful room you've created for your daughter. Your daughter's room is gorgeous. It's very sweet and feminine. I bet she just adores it. Her bed is fit for a princess! You did a wonderful job, Tricia. What a lovely room for a litte girl and it will grow with her too. The bedskirt you made looks wonderful. I'm glad she is not worried about the shark's teeth any longer. Her room turned out beautiful and your photography is stunning, as always! As if 80+ comments doesn't already say enough..I adore this room! It is spectacular…featured it today on my blog! Check it out and grab a button if you like! What a gorgeous room! It looks like the kind of place that she won't outgrow as she gets older. Tricia, do you happen to remember where you got the pink ruffled bedding from, I know it was a while ago! I'm looking for something similar for my daughter's bed, we just traded her twin for a full size. what a lucky girl…a room like this it's just a dream! Her room is so soft and precious. All the little details "make" it. can you share the wall color?! love this room! Totally inspired for my baby girls nursery! Love your work! Where did you get the iron bed?